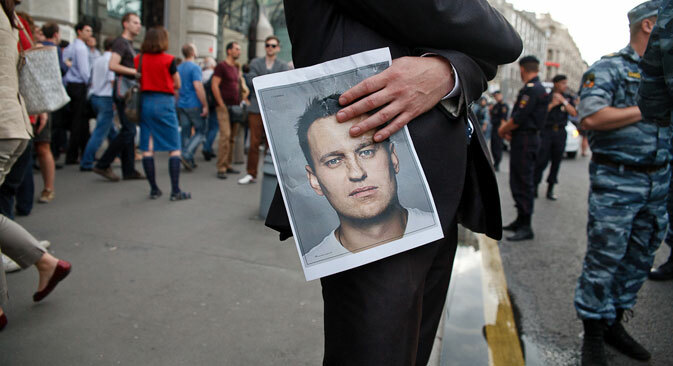 Blogosphere shows that Russian society is divided on opposition leader Alexei Navalny’s trial. The Russian blogosphere has been keeping a watchful eye on the Kirovles case, in which Kremlin critic Alexei Navalny was the main defendant. Comments from the courtroom began appearing on the morning of Thursday, July 18, along with reports on the situation in Kirov. Interested parties could follow online as the judge passed the sentence almost in real time. The five-year sentence slapped on Navalny caused a storm of criticism and a slew of negative comments. Politician Boris Nemtsov, Navalny’s associate and co-chairman of the liberal party RPR-PARNAS, wrote in his blog that he is sorry for Navalny’s wife and parents. Journalist Darya Mazayeva writes that she has had many calls from people wishing to discuss the sentence: “You can beat me, you can trample on me all you want, but when someone’s obviously guilty, he must make no noise about unfair elections and things like that. The idea that Navalny is a victim of the bloody regime is utter nonsense. His real rating is marginal." "Further, I personally know that he’s had contacts in the Kremlin for years. The information he leaked in Live Journal were inspired by some political forces. Navalny chose the wrong Kremlin group to back. That’s his mistake. Why snivel and whine? He did steal, there’s evidence that he did, so don’t make yourselves an idol, don’t make Navalny or Putin your idols, just learn to think more,” she added.